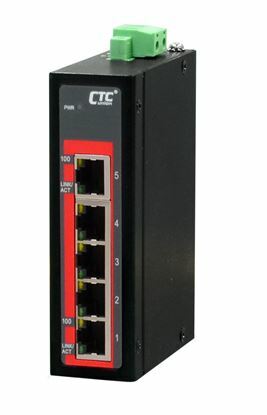 CTC UNION 4 Port Fast Ethernet Managed Switch. 4x 10/100BaseT(X) CTC UNION 4 Port Fast Ethernet Managed Switch. 4x 10/100BaseT(X) , + 2x 100/1000Base-X SFP (Total 6x Ports). -10~60C. Power consumption V DC/W: 12/5.7, 24/ 5.8, 48/8.5. Dinmount kit incl. 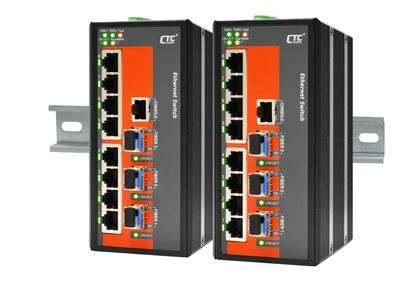 CTC UNION 4 Port Fast Ethernet Managed Switch. 4x 10/100BaseT(X) CTC UNION 4 Port Fast Ethernet Managed Switch. 4x 10/100BaseT(X) , + 2x 100/1000BaseX SFP (Total 6x Ports). -40~75C. Power consumption V DC/W: 12/5.7, 24/ 5.8, 48/8.5. Dinmount kit incl. CTC UNION 8 Port Fast Ethernet Unmanaged Switch. 8x 10/100BaseT(X) CTC UNION 8 Port Fast Ethernet Unmanaged Switch. 8x 10/100BaseT(X) . -10C~60C. Power consumption 12/24/48V DC/3.9W. Din-kit incl. CTC UNION 8 Port Fast Ethernet Unmanaged Switch. 8x 10/100BaseT(X) CTC UNION 8 Port Fast Ethernet Unmanaged Switch. 8x 10/100BaseT(X) . -40C~75C. Power consumption 12/24/48V DC/3.9W. Din-kit incl. CTC UNION 16 Port Fast Ethernet Managed Switch. 16x 10/100Base-T(X) CTC UNION 16 Port Fast Ethernet Managed Switch. 16x 10/100Base-T(X) , + 4x 100/1000Base-X SFP (Total 20x ports). -10~60C. Power consumption V DC/W: 12/10.8, 24/ 10.6, 48/12.5. Dinmount kit incl. CTC UNION 16 Port Fast Ethernet Managed Switch. 16x 10/100Base-T(X) CTC UNION 16 Port Fast Ethernet Managed Switch. 16x 10/100Base-T(X) , + 4x 100/1000Base-X SFP (Total 20x ports). -40~75C. Power consumption V DC/W: 12/10.8, 24/ 10.6, 48/12.5. Dinmount kit incl.